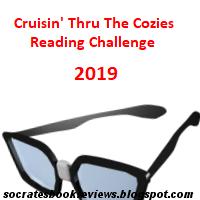 Welcome to the ninth annual Cruisin' thru the Cozies Reading Challenge! Once again, I'm giving challengers two options - one is to read only sub-genres and the other is to read cozy mysteries of your choice. 1. The challenge runs from January 1, 2019 and ends December 31, 2019. Charming challenge! I am currently reading a cozy, but not for review on my blog. Thanks for hosting again! I'm in for Level 1 Option A.
I'm thinking about it! I seem to read more historical or traditional mysteries these days, than cozies, but there are some series I'm still trying to follow. I'm looking forward to it! I'm aiming for level two option B. It's been awhile since I did any challenges and this one seems interesting and bound to get me out of my reading comfort zone. Thanks for hosting! ACK! The darn link was pre-filled cause my browser remembers the last challenge I signed up for. Yvonne, can you delete #8 for me? I'll redo it once it's deleted. It would sit empty if I did one right away. Thanks and sorry about that! No problem. I deleted it. I would join this, but I don't know what a URL is. An url is a link to your blog post about the challenge. I live cozies and this seems like the perfect challenge to justify reading more of them! Thanks for hosting. I'm in.I joined the Goodreads group. I'm excited to dive into challenge! Hi! I love cozies. So, it's a level 2 A for me. This is my first year participating in reading challenges on various blogs. Thank you for hosting this one. I am embarrassed, I accidentally posted to my home page through Mr. Linky. Can you please delete it, so I can fix it when I have the post up. It's fixed. You can add your link to it now. welcome to the challenge and have fun! This is a great post! 🙂 I joined this challenge. I appreciate all the things you do for other bloggers. Thank you for the shout out. I tried to post on your blog but I'm not sure if it showed up or not.